We had a great experience with your team. I as very worried about booking a place in another country and not knowing what to expect and wondering if it was legit or not. We were very pleased and would use it again. Thank you very much. We loved our stay the property was nice and it was clean. Tammy the home owner was very wonderful and helpful. We enjoyed meeting the other guest staying in units near by.There were chairs for us to lay on at the beach and beach towels at the house, that was nice.The only thing that would have been better would have been if there had been a table and chairs outside to eat at or play games on also. We would definitely stay again. REPLY: We are happy you enjoyed yourselves, and we'll let Tammy know about the table and chairs idea. Thank you! Loved the accommodations and location. West Bay and West End are within walking distance along the shore or you can take a water taxi. We snorkeled right off of the beach in front of our apartment and saw all sorts of marine life and beautiful coral. Property Manager Tammy helped with any needs or you can ask locals for activity suggestions. Beautiful beautiful island and people! The team was very nice and friendly, always able to help, the property is super well located and comfortable. 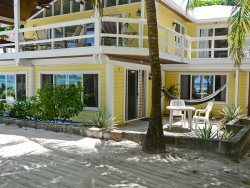 We were in Roatan during Holy Week in high season, and the prices are very accessible. Highly recommended. Alex and Dania REPLY: Thank you very much for your kind words, we are happy you enjoyed yourselves and hope to have you back! The team was very nice and friendly, always able to help, the property is super well located and comfortable. We were in Roatan during Holy Week in high season, and the prices are very accessible. Highly recommended. The property was very nice. The kitchen items could have been a bit cleaner. Just a quick note that the dishwasher isn't overly effective...things need to go in almost clean or they don't come out clean. Also, the pillows on all the beds could use an upgrade. This was our second stay at this property and we so, so enjoyed our time there. REPLY: Thank you very much for your review. We have spoken with our cleaning staff about the kitchen utensils and that will not be a problem going forward. Our maintenance staff has addressed the dishwasher and we've passed this along to the owners regarding the pillows. We hope to have you back soon! Shanna, Fernando and Carlene of Island House Vacation Rentals were all wonderful and so friendly and kind to us. Whatever we needed, Fernando would respond to our call or email right away to help us out. We were well taken care of! This property was absolutely fabulous - every amenity you can think of is there at the house! We are looking forward to our next stay at Ocho Palmos! REPLY: Thank you so much, we look forward to seeing you all again! Everyone on the property during our stay were very helpful. This condo was amazing! It was comfortable and clean. The condo has everything you need for a perfect vacation! The roof top was incredible especially during sunset! We felt very safe coming and going from the condo day and night. It is just a short walk to the beach and all West Bay has to offer. So many great restaurants within walking distance and a small store right around the corner. This was the perfect place to stay to relax, enjoy and explore the beauty of Roatan! REPLY: Thank you so much for your kind review, we are glad you enjoyed yourself! Please come back and stay with us again soon. Great team members. Very friendly. Never saw anyone from Island House Rentals but Zoro and Carmela were perfect hosts. This is simply a great house. Halfway between West End and West Bay. An easy 25 minute walk either way. Or 4 minutes from the easily hailed water taxi from the dock. If you are walking at dark, bring a head lamp. It's really dark, but beautiful. We had had the whole property for 10 people and was excellent. It's on the beach. I mean on the beach. The dock was the best hangout. OK, the Tiki bar got it's fair share of use. Stay here. REPLY: Thank you so much for the kind review! We flew in from Montreal and had 2 lengthy layovers. When we got to the airport our transport was waiting for us. The team is very friendly, courteous and very helpful! When we arrived at the house one of the rooms was made up as a king bed and not the 2 twins we originally asked for. Fernando took care of this immediately! They made the experience very simple and easy which we appreciated tremendously! Our stay at Sunset House exceeded our expectations. The general consensus of the family was that this was our best vacation to date! We travelled from Montreal as a group of 8. The house accommodated us perfectly (we booked the entire house / did not book guest house)You are literally steps away from the beach! Hamac's, beach chairs were used every day to relax and unwind! The location and proximity to both West Bay and West End, the cleanliness of the house, the beach bar with Napolean BBQ (which is where we spent most of our time!) and dock, the paddleboards and kayaks as well as diving and beach accessories. The grounds keepers were always there to make sure everything was ok. They helped with transportation into West End as well as making sure the beach front was clean and swept everyday! Thank you Johnny and Mino. The owners have a great house and spared no cost in furnishing it with all the right amenities. The only down side was the sketchy internet service but in the end this allowed us to put the computers away and truly enjoy the vacation! Thanks for allowing us to enjoy!!! REPLY: We are happy you enjoyed yourselves so much! You are correct, the owners love to trick out Sunset House! Coming soon is a new, BETTER grill and a dartboard. We hope to have you back again. My husband and I stayed 12 days at Carmelas Beach Cottage; the cottage is really beautiful and magically, Zoro & Carmela owners are blessed to have such a gem. They were hands on and can assist with anything you may need or want in Roatan they are connected and will did not disappoint. The Cottage was immaculate with great amenities, so very comfortable. ( Great bed is always important) The beach is well groomed by Zoro and neighbors wonderful. A 10 min walk to West Bay and 20 min walk to West End, provides this property to be in the best location as it offers so many options and privacy. The water is warm and the reef is accessible by Kayak and snorkeling is highly recommended. Fresh fish ask Zoro he will have someone come by. I highly recommend this lovely oasis we wished we could have stayed longer; we hope to return. Casa Martin is our favorite place. We love the beachfront and hanging out on the spacious deck. We booked again for next year an can't wait to get back. REPLY: Thank you, we look forward to having you back! Fernando was just an outstanding host and really made our trip hassle free. We loved the property - only downside was many evenings it was just too windy to enjoy the outdoor patio areas.